It looked like an April Fool’s joke, even though the page went live on March 31: Amazon would let brands send you stick-on Wi-Fi buttons that, when pressed, would automatically place a re-order for commonly used items like diapers, trash bags and detergent. But it’s no joke! It’s a way for Amazon to extend its product hegemony, align with brands, reduce friction, and cause nausea in a subset of consumers. It’s rather clever, but threatens to introduce several points of failure for users, the associated brand names, and Amazon customer support. 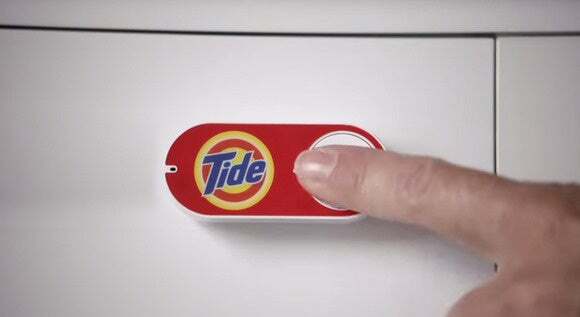 The Amazon Dash Button is currently available only by invitation to Amazon Prime members. Why did we get 1,000 rolls of Bounty? The new button is a tiny Wi-Fi-enabled device that’s configured via a smartphone app to connect to your Wi-Fi network. You can choose which of a brand’s offerings you want to signal for re-order when the button is pressed. It’s adhesive-backed and comes with a hook. Amazon Dash portends to turn homes into branding exhibitions. Fortunately, there are clearly some child-rearers among Amazon’s design and marketing staff. You can only use the button once between deliveries. And, when pressed, an associated smartphone gets an alert, and, as with normal Prime orders, it can be canceled within a period of time. Amazon already offers Subscribe & Save, a highly discounted recurring delivery service that my wife and I used to order diapers, among other things. This service gives Amazon the advantage of demand prediction, lowering its costs. 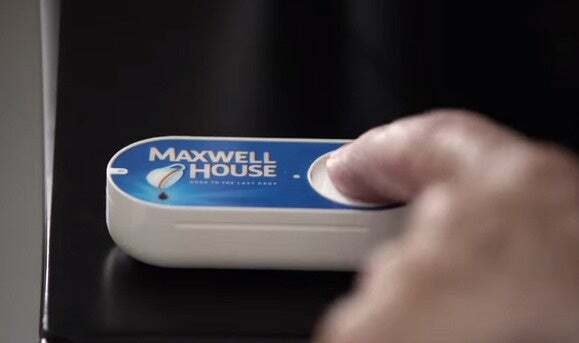 The Dash Button seems like a mid-way point between automatic subscriptions and the extreme tedium of, you know, opening the Amazon Store app or a browser window and clicking Order. The button seems laughable at first. How many consumers who shop with Amazon are such brand lovers that they want a button in their house, on various products, announcing their marriage to a given product offering? And managing expectations seems like a problem. The buttons surely include “button” style flat batteries. I expect that Amazon will just send you a new Dash Button when it detects the battery is depleting. But what happens if your Internet connection is down? Or you move your Wi-Fi base station or stations? Or you change your Wi-Fi network name? And so on. Negative knowledge—information that tells you that nothing happened—is often more critical than affirmative knowledge. When you press the button and nothing happens, what’s your response? Frustration with Amazon and the product’s maker, or do you blame yourself? And do you then fire up a session with Amazon customer service to…troubleshoot a button? More likely, Dash hits the trash. But, yes, there are alerts on the Amazon app. What seems vastly more interesting is the related Dash Replenishment Service (DRS), which Amazon will be rolling out in some devices this fall, like washing machines. This fully integrated item automatically re-orders specific supplies for you when the hardware determines it’s necessary—no button press required. While Amazon is launching the Dash Button with brand names, like Whirlpool and Brita, it’s encouraging all comers. The brands will certainly have deals with other brands, but I expect that smaller and more interesting companies can produce a custom pipeline, letting you configure all sorts of replenishables. There is certainly a subset of people who prefer to order nothing from Amazon. I have conflicted emotions about their anti-competitive behavior, which veers into what I would describe as unethical even if perfectly legal. Yet we still order because of pricing and convenience. There were buttons and switches everywhere—buttons to call for food for music, for clothing.…There was the button that produced literature. and there were of course the buttons by which she communicated with her friends. The room, though it contained nothing, was in touch with all that she cared for in the world. 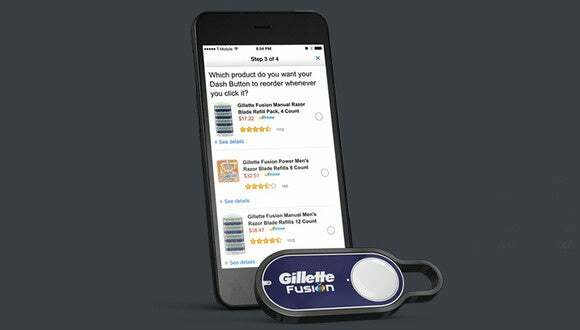 This story, "Don't dash to Dash: new Amazon buttons aid brands, not consumers" was originally published by Macworld.